Previously, on MinerBumping... Coherence-optional ice miner Moonsong Miner was jostled out of her bot-aspirant subroutines when the New Order repeatedly invaded her favorite mining systems. Moonsong became an instant sensation. 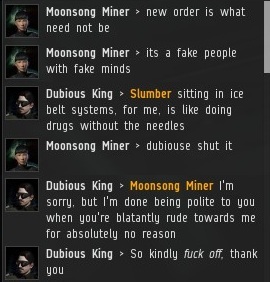 The EVE community found her broken English and broken thought patterns quite charming. She urged her fellow miners to disregard whatever they've read about her. At first, she offered the miners hope: You can run from the New Order. But at times, even Moonsong is exhausted by the relentless Order. Before leaving Brapelille (again), she bid her people adieu. She's in hiding. 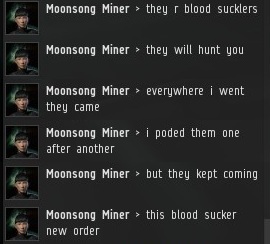 We all know how that works out, though--if it's highsec, it's New Order territory. Enough of the meta. Back in Deninard, Moonsong was disturbed by Agent Droopsack's presence. Droopsack is rumored to be a scout of the New Order. 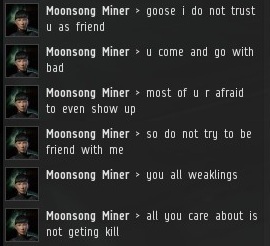 Our scouts are the most feared people in highsec. They're harbingers of death, and just one of them in local can spell certain doom for the miners. 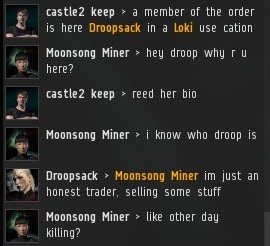 Moonsong has her priorities. She warned the rest of the ice field to be on the lookout for New Order scouts and New Order scouts only. 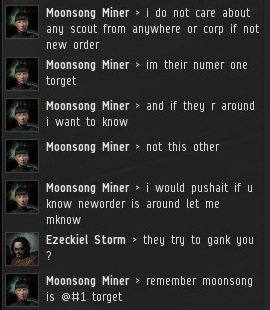 In a sign of the changing times, Moonsong and other enemies of the New Order now admit that miners across highsec are lining up to buy permits. In the old days, denialists would claim that no miners have paid, and that the New Order isn't doing anything. Things are different now. Moonsong and her friends in Deninard, under constant threat, became paranoid. Anyone could be a spy for the New Order. 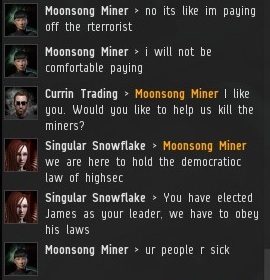 Out of nowhere, Moonsong accused Loratin of being a sympathizer and informant. 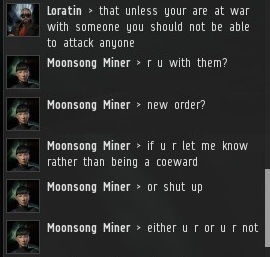 Loratin and Dubious King were having a debate about whether wardec mechanics should be limited to mutual wars only, a popular topic of conversation in highsec. For reasons known only to herself (if even her), this was proof of New Order affiliation. 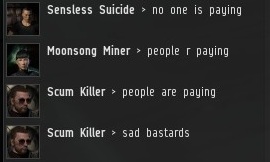 The mining community is hopelessly divided. Some are pro-Order, some are anti-Order. But the anti-Order forces see a potential New Order spy in everyone. We have offered Moonsong a place in the New Order, but she has so far declined. Sometimes she offers us a truce, but at a moment's notice, the feud is back on. 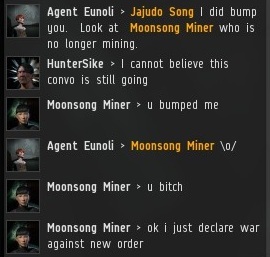 As time goes on, Moonsong has become increasingly disillusioned with her fellow miners. She asks for Orca boosts, but no one is there. They're AFK or botting, and they won't help her defend the ice fields. Such is the fate of all who would lead the rebel forces. In time, they come to despise the bot-aspirants as much as we do. 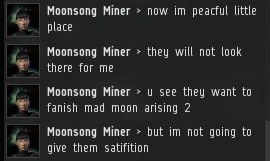 Could Moonsong switch sides, too? Time will tell. I'm tempted to have my bumping alt own an Orca again ... people receiving Fleet boosts can be fleet warped TO gankers. bad idea since that means gankers will have to wait in space for them to arrive, which means concord will get to the gankers first. Good point. 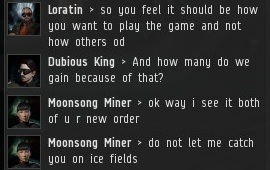 Warp the miner to a "safe" spot, and then launch the gank fleet there. If the miner gets to the keyboard at any time, they can just hit ctrl-space, and be rewarded for ATK by not getting ganked. You could try having the gank fleet warp to them, though. Chances are they will not be keeping close eyes on the fleet - there's probably only a slim chance they'll look at the members when they join. However this trick will probably only work a few times. It will only have to work a few times to make bot-aspirants paranoid about joining pick-up fleets. Which is another blow against them. "I losted faith in miners"
Wow! Thank you! I regularly desired to create on my weblog something like that. Can I consist of a aspect of your publish to my website?